The Becher Chase at Aintree has long been a race in which specialists excel year after year and the exploits of past masters highlight the each-way betting claims of several returnees ahead of the 2018 edition, including 2016 winner Vieux Lion Rouge, who’s currently trading at 12/1. 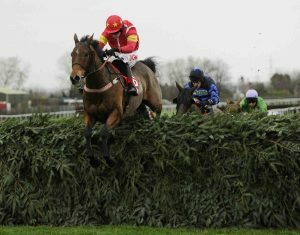 Hello Bud (2011 and 2013) and Into The Red (1994 and 1996) may be the only dual winners in the 26-year history of the 3m2f contest over the Grand National fences, but past runnings are littered with repeat placers. They include two of last year’s 1-2-3, with Highland Lodge a winner in 2015, second in 2016 and third in 2017 and The Last Samuri, third in 2016 and second last year. Further back, the likes of Royal Rosa, Mr Pointment, Bewleys Berry, Just In Debt and Amberleigh House all hit the first three in consecutive editions this side of the millennium. What chances of last year’s Becher Chase medallists rewarding each-way odds backers again? Blaklion, currently priced up at 7/1, would surely be a glorious thieves’ bet, carrying only 5lbs more than when winning by 9l last year. But he seems unlikely to run, with Sam Twiston-Davies’ telling Gloucestershire Live early last week that he wouldn’t be out until Christmas. The Last Samuri trades at 10/1 in the Becher Chase betting but holds an alternative engagement in the Many Clouds Chase later the same afternoon, for which he’s just 5/1. He would be a nice each-way play on his first start for new trainer Harry Fry if taking his chance over the National fences, but again his participation is far from guaranteed. Highland Lodge is a ripe old 12 these days but should be fully revved up for his cup final and the current 16/1 resembles value, with four places surely in play. Dropped 3lbs to 135 ahead of the 2018 race, he’s now 2lbs lower than when a short-head second to Vieux Lion Rouge in the 2016 edition. And placers from previous years? Given Hello Bud and Into The Red had year gaps between their first and second Becher Chase victories, it’s worth scrutinising places from previous editions and 2016 winner Vieux Lion Rouge could be poised to emulate them. David Pipe’s gelding is still just nine years old and has fallen back to a mark of 146, the exact mark off which he won the Becher two years ago off 11st 12lbs, after a credible ninth in the Grand National in April. Currently set to shoulder a stone less this time around, he could be primed to run a massive race on his first run following wind surgery at odds of 12/1. One other returning past medallist who catches the eye is 2015 second Dare to Endeavour. The 66/1 shot hasn’t done a great deal to endear himself to punters in the interim, but will be bottom weight if taking his chance and has a proven liking for the race in his favour over many of his opponents.